Osmophobia means "abnormal sensitivity to smell". Perhaps more precisely, it is fear of smell. While sound sensitivity is divided up into a variety of subcategories -- for example, misophonia, hyperacusis, phonophobia, this doesn't seem to have been paid as much attention to with smell. Osmophobia is an uncommon symptom with few causes. There are many other senses and smell sensitivity is just one of many possibilities. Here we are going to mainly concentrate on migraine, but we will try to put it into context with other smell disorders. Smell sensitivity is rare, and usually attributed to migraine or psychological conditions. However, sometimes it is reported in motion sickness, and presumably there is come cross-over with other sensory sensitivities that accompany other medical conditions (e.g. pregnancy, liver failure). Smell sensitivity also occurs in "multiple chemical sensitivity" (Alobid et al, 2014) According to Henkin et al, patients with Cystic fibrosis have lowered thresholds to taste and smell (1962). Increased sensitivity to smell as well as other irritants may be a personality characteristic -- Bell et al (1994) suggested that "cacosmia" -- sensitivity to environmental chemical odors was associated with high ratings for stress in the first 4 decades of life, as well as increased prevalence of physician-diagnosed nasal allergies, breast cysts, hypothyroidism, sinusitis, food sensitivities, irritable bowel, and migraine headache. We suspect there is something to the idea that there are individuals who have a sensitive personality style. Smell sensitivity ordinarily goes down with age. (Seow et al, 2016). The technology of measurement of measuring sensory hypersensitivity is probably best worked out for sound, where assessment of "LDL" or loudness discomfort levels are routine when fitting hearing aids. One would think that for all of these situations, one should "adjust" the discomfort level for the threshold -- or in other words, attempt to differentiate between the input to the brain and the response to the brain. For hearing, this can be done by subtracting the pure tone threshold from the LDL. This simple concept does not seem to have penetrated into the literature about other senses. As is the case with sound and light sensitivity, for measurement, there is an attempt to distinguish between having a lower threshold, and having greater discomfort. There are also instruments that identify substances that one can detect. This is called "discrimination". The UPSIT smell identification test is one way to assess -- this is a "scratch and sniff" technology type test. It costs about $30/patient to administer, so perhaps not the most appropriate method for a clinic. Another test that may be more cost effective is the "sniffin sticks". These are multiple use. Another consideration is that as is the case with light, sound, and other senses, during a migraine, smell may be more bothersome to migraine patients. Demarquay et al (2006) used the term "hedonicity" for the pleasentness of smells, and reported that patients with olfactory hypersensitivity judged odors less pleasant, but of equal intencity. 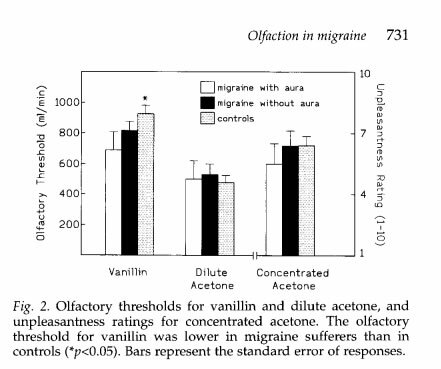 Saisu et al (2011) reported how "offensive" odors were to migraine patients, and noted that perfume, rose and Japanese cypress odors were more "offensive to migraine patients" than controls. One would naturally wonder if patients with migraine might be conditioned to dislike strong odors, because of the association with pain. In other words, perhaps this is a learned response. Similarly to loud noise, motion, or strong light, strong smells have been reported to cause migraines. Blau and Solomon (1985) reported that odors, pleasant or otherwise, could precipitate migraine in 11 out of 50 patients. Kelman reported that perfume or odor triggers migraine in about 50%. The general consensus is that smell is very specific but insensitive. Here we are talking about the offensiveness of odors, not whether or not they can be detected. Chalmer et al, in a "nosographic analysis of osmophobia" (ha ha), reported that roughly 1/3 of migraine patients report osmophobia, but only 1.2% of tension headache patients. (Chalmer et al, 2018). Chitsaz et al (2017) found that a much higher percentage of both migraine and tension headache patients (about 74% vs 43%) reported osmophobia. Spiering's et al (2001) reported that weather, smell of smoke and light were precipitating factors that differentiated migraine from tension headache. Silva-Neto et al (2014) also suggested that osmophobia "may be a specific marker to differentiate migraine from tension-type headache". As both migraine and tension are artificial constructs based on meeting entirely subjective criteria, we are dubious that there is much significance to this observation other than the question set answer affirmatively by migraine patients seems to correlate with osmophobia as well. Kelman (2004) reported that nearly half of 724 migraine patients reported perfume or odor triggers for migraines. This seems a bit high. Kelman reported again in 2004 that "Osmophobia and taste abnormalities were demonstrated to be very specific in diagnosing migraine IHS 1.1-1.6, but very insensitive." This seems more reasonable. Zanchin et al (2005) again concluded that osmophobia is a very specific marker for migraine, separating it from other primary headaches and tension headaches. Corletto et al (2008) again concluded that osmophobia is specific but insensitive. De Carlo et al (2012) reported that osmophobia is "one of the major predictors for the development of migraine". Wang et al (2012) suggest that osmophobia might be a preferable diagnostic criteria in asian migraineurs, among whom photophobia was less common. Finally, some patients with migraine, as is the case as with light, may have an "olfactory aura". (Diamond et al, 1985; Coleman et al, 2011; Mainardi et al, 2016). Intensity of smell perception in migraine subjects. Figure 2 from Snyder and Drummond (1997). Snyder and Drummond (1997) compared 20 patients with migraine, mainly women, with 21 patients with fewer than 8 headaches per year. They found that patients with migraine or migraine with aura had slightly lower thresholds to vanillin than controls. The migraine patients did not find acetone more unpleasant than controls. Hirsch (1992) reported that 18% of patients were low or unable to smell Pyridine. This is somewhat opposite to Synder and Drummond, but perhaps there is something special about Pyridine. Somewhat similarly, Marmura et al (2014) reported that about 25% of their 42 migraine attack subjects reported a drop in their sense of smell during attacks. Again, Whiting et al (2015) reported that migraine subjects were slieghtly less sensitive to the UPSIT test on both migraine and non-migraine days. Contrary to these observations, Harriott (2014) suggested that Migraineurs report sensitivity to odors during and between attacks (this is a vague statement), and also quoted the same paper as above (Snyder and Drummond) to suggest that acetone "is detected at lower concentrations in migraineurs who report osmosensitivity". Perhaps there are two groups of migraine patients - -those with smell sensitivity and those without ? This would fit into the general conjecture that "migraine" is not a single disorder. If we adopt this idea however, we need to do a lot more "splitting". It would seem from these data that smell intensity ratings are unlikely to be useful for migraine diagnosis, but might be useful to separate out a subgroup. Alobid, I., et al. (2014). "Multiple chemical sensitivity worsens quality of life and cognitive and sensorial features of sense of smell." Eur Arch Otorhinolaryngol 271(12): 3203-3208. Bell, I. R., et al. (1994). "Sensitization to early life stress and response to chemical odors in older adults." Biol Psychiatry 35(11): 857-863. Blau, J. N. and F. Solomon (1985). "Smell and other sensory disturbances in migraine." J Neurol 232(5): 275-276. Chalmer, M. A., et al. (2018). "Nosographic analysis of osmophobia and field testing of diagnostic criteria including osmophobia." Cephalalgia: 333102418771375. Chitsaz, A., et al. (2017). "The Prevalence of Osmophobia in Migranous and Episodic Tension Type Headaches." Adv Biomed Res 6: 44. Coleman, E. R., et al. (2011). "Olfactory hallucinations in primary headache disorders: case series and literature review." Cephalalgia 31(14): 1477-1489. Corletto, E., et al. (2008). "Osmophobia in juvenile primary headaches." Cephalalgia 28(8): 825-831. De Carlo, D., et al. (2012). "Osmophobia as an early marker of migraine: a follow-up study in juvenile patients." Cephalalgia 32(5): 401-406. Diamond, S., et al. (1985). "Olfactory aura in migraine." N Engl J Med 312(21): 1390-1391. Demarquay, G., et al. (2006). "Rating of olfactory judgements in migraine patients." Cephalalgia 26(9): 1123-1130. Henkin, R. I. and G. F. Powell (1962). "Increased sensitivity of taste and smell in cystic fibrosis." Science 138(3545): 1107-1108. Hirsch, A. R. (1992). "Olfaction in migraineurs." Headache 32(5): 233-236. Kayabasoglu, G., et al. (2017). "Osmophobia and olfactory functions in patients with migraine." Eur Arch Otorhinolaryngol 274(2): 817-821. Kelman, L. (2004). "Osmophobia and taste abnormality in migraineurs: a tertiary care study." Headache 44(10): 1019-1023. Kelman, L. (2004). "The place of osmophobia and taste abnormalities in migraine classification: a tertiary care study of 1237 patients." Cephalalgia 24(11): 940-946. Mainardi, F., et al. (2016). "Scent of aura? Clinical features of olfactory hallucinations during a migraine attack (OHM)." Cephalalgia. Nordin, S., et al. (1995). "Unawareness of smell loss in normal aging and Alzheimer's disease: discrepancy between self-reported and diagnosed smell sensitivity." J Gerontol B Psychol Sci Soc Sci 50(4): P187-192. Rocha-Filho, P. A., et al. (2016). "Migraine, Osmophobia, and Anxiety." Pain Med 17(4): 776-780. Saisu, A., et al. (2011). "Evaluation of olfaction in patients with migraine using an odour stick identification test." Cephalalgia 31(9): 1023-1028. Seow, Y. X., et al. (2016). "Odor-Specific Loss of Smell Sensitivity with Age as Revealed by the Specific Sensitivity Test." Chem Senses 41(6): 487-495. Snyder, R. D. and P. D. Drummond (1997). "Olfaction in migraine." Cephalalgia 17(7): 729-732. Spierings, E. L., et al. (2001). "Precipitating and aggravating factors of migraine versus tension-type headache." Headache 41(6): 554-558. Wang, Y. F., et al. (2012). "Clinical correlates and diagnostic utility of osmophobia in migraine." Cephalalgia 32(16): 1180-1188. Whiting, A. C., et al. (2015). "Olfactory acuity in chronic migraine: a cross-sectional study." Headache 55(1): 71-75. Zanchin, G., et al. (2005). "Osmophobia in primary headaches." J Headache Pain 6(4): 213-215.